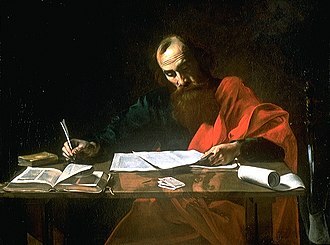 Matthew the Apostle (Hebrew: מַתִּתְיָהוּ‎ Mattityahu or מתי Matt, متى Arabic "Gift of YHVH"; Greek: Μαθθαῖος, translit. Maththaîos; Coptic: ⲙⲁⲧⲑⲉⲟⲥ; also known as Saint Matthew and as Levi) was, according to the Christian Bible, one of the twelve apostles of Jesus and, according to Christian tradition, one of the four Evangelists. Among the early followers and apostles of Jesus, Matthew is mentioned in Matthew 9:9 and Matthew 10:3 as a publican (KJV) or tax collector (NIV) who, while sitting at the "receipt of custom" in Capernaum, was called to follow Jesus. 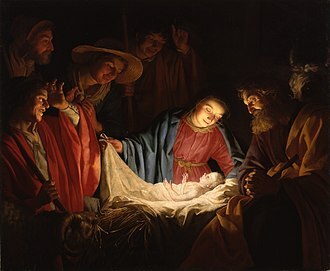 He is also listed among the twelve, but without identification of his background, in Mark 3:18, Luke 6:15 and Acts 1:13. In passages parallel to Matthew 9:9, both Mark 2:14 and Luke 5:27 describe Jesus' calling of the tax collector Levi, the son of Alphaeus, but Mark and Luke never explicitly equate this Levi with the Matthew named as one of the twelve. Levi was a 1st-century Galilean (presumably born in Galilee, which was not part of Judea or the Roman Iudaea province), the son of Alphaeus. As a tax collector he would have been literate in Aramaic and Greek. His fellow Jews would have despised him for what was seen as collaborating with the Roman occupation force. The New Testament records that as a disciple, he followed Jesus, and was one of the witnesses of the Resurrection and the Ascension of Jesus. Afterwards, the disciples withdrew to an upper room (Acts 1:10–14) (traditionally the Cenacle) in Jerusalem. The disciples remained in and about Jerusalem and proclaimed that Jesus was the promised Messiah. 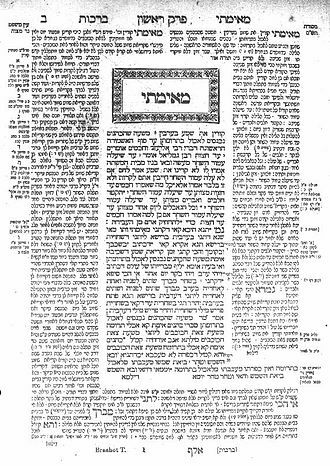 In the Babylonian Talmud (Sanhedrin 43a) "Mattai" is one of five disciples of "Jeshu". Later Church fathers such as Irenaeus (Against Heresies 3.1.1) and Clement of Alexandria claim that Matthew preached the Gospel to the Jewish community in Judea, before going to other countries. Ancient writers are not agreed as to what these other countries are. The Roman Catholic Church and the Orthodox Church each hold the tradition that Matthew died as a martyr, although this was rejected by the gnostic heretic Heracleon as early as the second century. 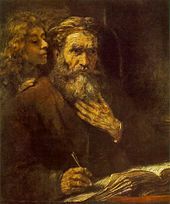 Saint Matthew and the Angel (1661) by Rembrandt. 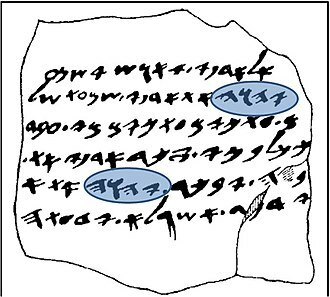 On the surface, this has been taken to imply that Matthew's Gospel itself was written in Hebrew or Aramaic by the apostle Matthew and later translated into Greek, but nowhere does the author claim to have been an eyewitness to events, and Matthew's Greek "reveals none of the telltale marks of a translation". 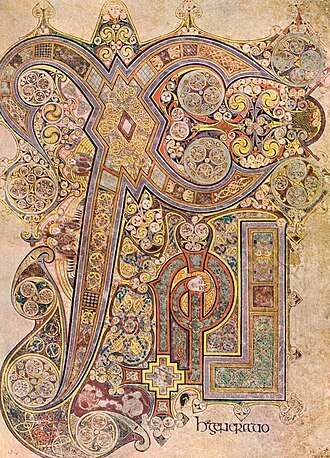 Scholars have put forward several theories to explain Papias: perhaps Matthew wrote two gospels, one, now lost, in Hebrew, the other our Greek version; or perhaps the logia was a collection of sayings rather than the gospel; or by dialektōi Papias may have meant that Matthew wrote in the Jewish style rather than in the Hebrew language. The consensus is that Papias does not describe the Gospel of Matthew as we know it, and it is generally accepted that Matthew was written in Greek, not in Aramaic or Hebrew. 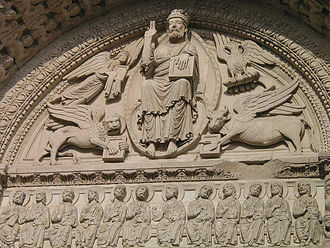 In the 3rd-century Jewish–Christian gospels attributed to Matthew were used by Jewish–Christian groups such as the Nazarenes and Ebionites. 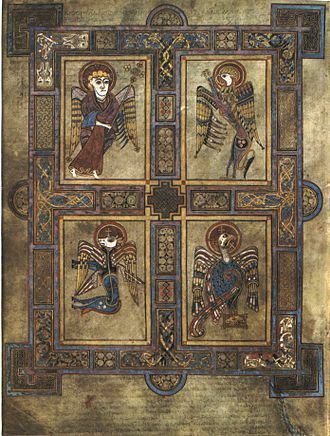 Fragments of these gospels survive in quotations by Jerome, Epiphanius and others. Most academic study follows the distinction of Gospel of the Nazarenes (26 fragments), Gospel of the Ebionites (7 fragments), and Gospel of the Hebrews (7 fragments) found in Schneemelcher's New Testament Apocrypha. Critical commentators generally regard these texts as having been composed in Greek and related to Greek Matthew. A minority of commentators consider them to be fragments of a lost Aramaic or Hebrew language original. 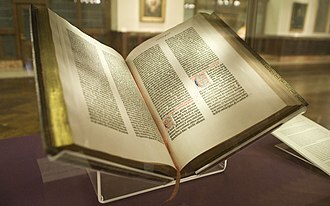 The Infancy Gospel of Matthew is a 7th-century compilation of three other texts: the Protevangelium of James, the Flight into Egypt, and the Infancy Gospel of Thomas. Origen said the first Gospel was written by Matthew. This Gospel was composed in Hebrew near Jerusalem for Hebrew Christians and translated into Greek, but the Greek copy was lost. The Hebrew original was kept at the Library of Caesarea. The Nazarene Community transcribed a copy for Jerome which he used in his work. Matthew's Gospel was called the Gospel according to the Hebrews or sometimes the Gospel of the Apostles and it was once believed that it was the original to the Greek Matthew found in the Bible. However, this has been challenged by modern biblical scholars such as Bart Ehrman and James R. Edwards. Jerome relates that Matthew was supposed by the Nazarenes to have composed their Gospel of the Hebrews though Irenaeus and Epiphanius of Salamis consider this simply a revised version canonical Gospel. This Gospel has been partially preserved in the writings of the Church Fathers, said to have been written by Matthew. Epiphanius does not make his own the claim about a Gospel of the Hebrews written by Matthew, a claim that he merely attributes to the heretical Ebionites. Matthew is recognized as a saint in the Roman Catholic, Eastern Orthodox, Lutheran and Anglican churches. (See St. Matthew's Church.) His feast day is celebrated on 21 September in the West and 16 November in the East. (For those churches which follow the traditional Julian Calendar, 16 November currently falls on 29 November of the modern Gregorian Calendar). 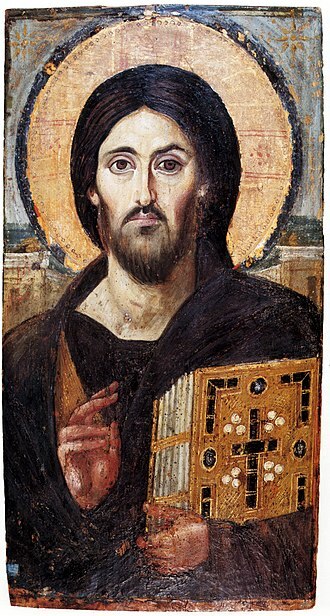 He is also commemorated by the Orthodox, together with the other Apostles, on 30 June (13 July), the Synaxis of the Holy Apostles. 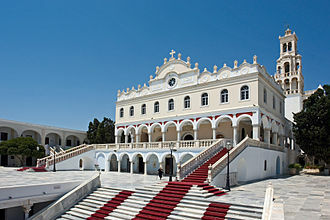 His tomb is located in the crypt of Salerno Cathedral in southern Italy. Like the other evangelists, Matthew is often depicted in Christian art with one of the four living creatures of Revelation 4:7. The one that accompanies him is in the form of a winged man. The three paintings of Matthew by Caravaggio in the church of San Luigi dei Francesi in Rome, where he is depicted as called by Christ from his profession as tax gatherer, are among the landmarks of Western art. The Quran speaks of Jesus' disciples but does not mention their names, instead referring to them as "helpers to the work of God". Muslim exegesis and Qur'an commentary, however, name them and include Matthew amongst the disciples. Muslim exegesis preserves the tradition that Matthew, with Andrew, were the two disciples who went to Ethiopia (not the African country, but a region called 'Ethiopia' south of the Caspian Sea) to preach the message of God. Irenaeus of Lyons (died c. 202 CE) makes a similar comment, possibly also drawing on Papias, in his Against Heresies, Book III, Chapter 1, "Matthew also issued a written Gospel among the Hebrews in their own dialect" (see Dwight Jeffrey Bingham (1998), Irenaeus' Use of Matthew's Gospel in Adversus Haereses, Peeters, p. 64 ff). ^ Easton, Matthew George (1897). "Matthew" . Easton's Bible Dictionary (New and revised ed.). T. Nelson and Sons. ^ "Cathedral of St. Matthew the Apostle, Washington, D.C". Stmatthewscathedral.org. 2013-09-21. Retrieved 2014-07-10. ^ a b c Herbermann, Charles, ed. (1913). "St. Matthew" . Catholic Encyclopedia. New York: Robert Appleton Company. ^ a b James Orr, ed. (1915). "The International Standard Bible Encyclopedia: Matthew". Studylight.org. Retrieved 2010-02-22. ^ Catherine Hezser (2001), Jewish Literacy in Roman Palestine, Mohr Siebeck, p. 172, ISBN 978-3161475467, retrieved 2014-09-10, Even if they were pious and able to read the Hebrew Bible and/or literate in Greek poetry and prose, the writing they had to do in every day life ... 24 For the evidence of tax receipts amongst the Judaean Desert papyri see section II. The Cambridge history of Judaism: 2 p192 ed. William David Davies, Louis Finkelstein "We are now touching upon that milieu in which Greek language and civilization were readily accepted in order to ... A great number of tax receipts on ostraca mainly from the 2nd century BCE show how Jews, Egyptians and Greeks.. "
^ Encyclopædia Britannica. 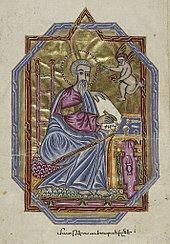 "Encyclopædia Britannica: Saint Matthew the Evangelist". Britannica.com. Retrieved 2010-02-22. 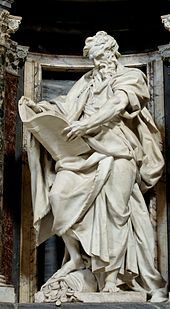 ^ "Saint Matthew". 21 September 2016. ^ Wilhelm Schneemelcher New Testament Apocrypha: Writings Relating to the Apostles revised edition translated R. McL. Wilson – 2003 Page 17 "in the Babylonian Talmud five disciples of Jesus are mentioned by name: 'Matthai, Nagai, Nezer, Buni, Thoda' (Sanhedrin 43a)." ^ Darrell L. Bock – Studying the Historical Jesus: A Guide to Sources and Methods – Page 164 2002 "The early church tradition is consistent in claiming that Matthew wrote his Gospel in Hebrew for the Jews (Irenaeus, Against Heresies 3.1.1)." ^ a b Harrington 1991, p. 8. ^ a b Turner 2008, p. 15–16. ^ Hagner 1986, p. 281. ^ Ehrman 1999, p. 43. ^ Edwards, James R. (2009). The Hebrew Gospel and the Development of the Synoptic Tradition. Wm. B. Eerdmans Publishing. p. 18. ISBN 978-0802862341. Repschinski, Boris (1998). The Controversy Stories in the Gospel of Matthew:... Vandenhoeck & Ruprecht. p. 14. ISBN 978-3525538739. ^ Edward Williams B. Nicholson, ed. (1979). The Gospel according to the Hebrews, its fragments tr. and annotated, with a critical analysis of the evidence relating to it, by E. B. Nicholson. [With] Corrections and suppl. notes. p. 82. ^ Saint Jerome (2000). Thomas P. Halton, ed. On Illustrious Men (The Fathers of the Church, Volume 100). CUA Press. p. 10. ISBN 978-0813201009. ^ Arland J. Hultgren; Steven A. Haggmark (1996). The Earliest Christian Heretics: Readings from Their Opponents. Fortress Press. p. 122. ISBN 978-0800629632. ^ Edward Williams B. Nicholson, ed. (1979). The Gospel according to the Hebrews, its fragments tr. and annotated, with a critical analysis of the evidence relating to it, by E. B. Nicholson. [With] Corrections and suppl. notes. p. 26. John Bovee Dods (1858). Gibson Smith, ed. The Gospel of Jesus. G. Smith. p. iv. ^ Harrison, Everett Falconer (1964). Introduction to the New Testament. Wm. B. Eerdmans Publishing. p. 152. ISBN 9780802847867. ^ a b Saint Epiphanius (Bishop of Constantia in Cyprus) (1987). Frank Williams, ed. The Panarion of Ephiphanius of Salamis: Book I (sects 1-46). BRILL. p. 129. ISBN 9789004079267. What they call a Gospel according to Matthew, though it is not entirely complete, but is corrupt and mutilated — and they call this thing 'Hebrew'! ^ "On Illustrious Men (The Fathers of the Church, Volume 100)". ^ Evangelical Lutheran Church in America: Lesser Festivals, Commemorations, and Occasions, Evangelical Lutheran Worship, page 57. Augsburg Fortress. Allison, D. C. (2004). Matthew: A Shorter Commentary. T&T Clark. ISBN 978-0-567-08249-7. Davies, W. D.; Allison, D. C. (2004). Matthew 1–7. T&T Clark. ISBN 978-0-567-08355-5. Davies, W. D.; Allison, D. C. (1991). Matthew 8–18. T&T Clark. ISBN 978-0-567-08365-4. Davies, W. D.; Allison, D. C. (1997). 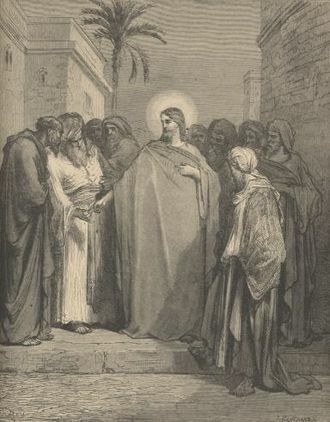 Matthew 19–28. T&T Clark. ISBN 978-0-567-08375-3. Duling, Dennis C. (2010). "The Gospel of Matthew". In Aune, David E. The Blackwell Companion to the New Testament. Wiley-Blackwell. ISBN 978-1-4051-0825-6. France, R. T. (2007). The Gospel of Matthew. Eerdmans. p. 19. ISBN 978-0-8028-2501-8. Keener, Craig S. (1999). A commentary on the Gospel of Matthew. Eerdmans. ISBN 978-0-8028-3821-6. Luz, Ulrich (1992). 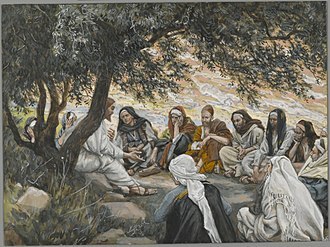 Matthew 1–7: a commentary. Fortress Press. ISBN 978-0-8006-9600-9. Luz, Ulrich (2001). Matthew 8–20: a commentary. Fortress Press. ISBN 978-0-8006-6034-5. Luz, Ulrich (2005). Matthew 21–28: a commentary. Fortress Press. ISBN 978-0-8006-3770-5. Morris, Leon (1992). The Gospel according to Matthew. Eerdmans. ISBN 978-0-85111-338-8. Nolland, John (2005). The Gospel of Matthew: A Commentary on the Greek Text. Eerdmans. ISBN 0802823890. Turner, David L. (2008). Matthew. Baker. ISBN 978-0-8010-2684-3. Beaton, Richard C. (2005). "How Matthew Writes". In Bockmuehl, Markus; Hagner, Donald A. The Written Gospel. Oxford University Press. ISBN 978-0-521-83285-4. Browning, W. R. F. (2004). Oxford Dictionary of the Bible. Oxford University Press. ISBN 978-0-19-860890-5. Casey, Maurice (2010). Jesus of Nazareth: An Independent Historian's Account of His Life and Teaching. Continuum. ISBN 978-0-567-64517-3. Clarke, Howard W. (2003). The Gospel of Matthew and Its Readers. Indiana University Press. ISBN 978-0-253-34235-5. Cross, Frank L.; Livingstone, Elizabeth A., eds. (2005) . "Matthew, Gospel acc. to St.". The Oxford Dictionary of the Christian Church (3 ed.). Oxford University Press. p. 1064. ISBN 978-0-19-280290-3. Archived from the original on 23 September 2015. Retrieved 14 November 2015. Dunn, James D. G. (2003). Jesus Remembered. Eerdmans. ISBN 978-0-8028-3931-2. Ehrman, Bart D. (1999). Jesus: Apocalyptic Prophet of the New Millennium. Oxford University Press. ISBN 978-0-19-512474-3. Ehrman, Bart D. (2012). Did Jesus Exist? : The Historical Argument for Jesus of Nazareth. HarperCollins. ISBN 978-0-06-220460-8. Fuller, Reginald H. (2001). "Biblical Theology". In Metzger, Bruce M.; Coogan, Michael D. The Oxford Guide to Ideas & Issues of the Bible. Oxford University Press. Hagner, D. A. (1986). "Matthew, Gospel According to". In Bromiley, Geoffrey W. International Standard Bible Encyclopedia, Vol. 3: K-P. Wm. 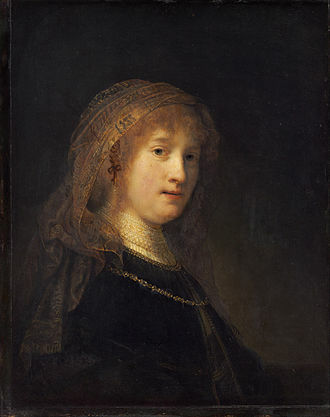 B. Eerdmans. pp. 280–8. ISBN 978-0-8028-8163-2. Harris, Stephen L. (1985). Understanding the Bible. Palo Alto: Mayfield. Kowalczyk, A. (2008). The influence of typology and texts of the Old Testament on the redaction of Matthew’s Gospel. Bernardinum. ISBN 978-83-7380-625-2. Kupp, David D. (1996). Matthew's Emmanuel: Divine Presence and God's People in the First Gospel. Cambridge University Press. ISBN 978-0-521-57007-7. Levine, Amy-Jill (2001). "Visions of kingdoms: From Pompey to the first Jewish revolt". In Coogan, Michael D. The Oxford History of the Biblical World. Oxford University Press. ISBN 978-0-19-513937-2. Levison, J.; Pope-Levison, P. (2009). "Christology". In Dyrness, William A.; Kärkkäinen, Veli-Matti. Global Dictionary of Theology. InterVarsity Press. Luz, Ulrich (2005). Studies in Matthew. Eerdmans. ISBN 978-0-8028-3964-0. Luz, Ulrich (1995). The Theology of the Gospel of Matthew. Cambridge University Press. ISBN 978-0-521-43576-5. McMahon, Christopher (2008). "Introduction to the Gospels and Acts of the Apostles". In Ruff, Jerry. Understanding the Bible: A Guide to Reading the Scriptures. Cambridge University Press. Peppard, Michael (2011). The Son of God in the Roman World: Divine Sonship in Its Social and Political Context. Oxford University Press. 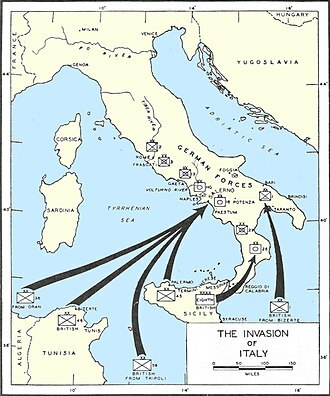 Saldarini, Anthony (2003). "Matthew". Eerdmans commentary on the Bible. ISBN 0802837115. , in Dunn, James D. G.; Rogerson, John William (2003). Eerdmans Commentary on the Bible. Eerdmans. ISBN 978-0-8028-3711-0. 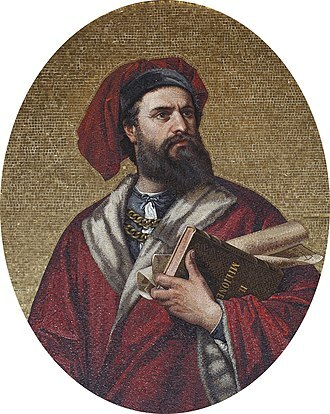 Saldarini, Anthony (1994). Matthew's Christian-Jewish Community. University of Chicago Press. ISBN 978-0-226-73421-7. Sanford, Christopher B. (2005). Matthew: Christian Rabbi. Author House. Scholtz, Donald (2009). Jesus in the Gospels and Acts: Introducing the New Testament. Saint Mary's Press. Stanton, Graham (1993). A gospel for a new people: studies in Matthew. Westminster John Knox Press. ISBN 978-0-664-25499-5. Strecker, Georg (2000) . Theology of the New Testament. Walter de Gruyter. ISBN 978-0-664-22336-6. Tuckett, Christopher Mark (2001). Christology and the New Testament: Jesus and His Earliest Followers. Westminster John Knox Press. 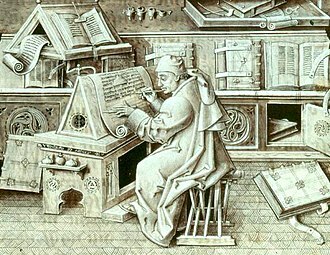 Wikimedia Commons has media related to Saint Matthew. Guido Reni was an Italian painter of high-Baroque style. Born in Bologna into a family of musicians, Guido Reni was the son of Daniele Reni, as a child of nine, he was apprenticed under the Bolognese studio of Denis Calvaert. Soon after, he was joined in studio by Albani. 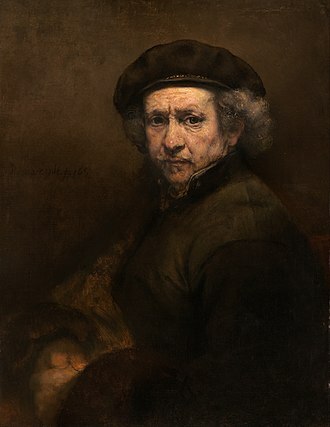 He may have trained with a painter by the name of Ferrantini, when Reni was about twenty years old, the three Calvaert pupils migrated to the rising rival studio, named Accademia degli Incamminati, led by Lodovico Carracci. They went on to form the nucleus of a prolific and successful school of Bolognese painters who followed Lodovicos cousin Annibale Carracci to Rome, like many other Bolognese painters, Renis painting was thematic and eclectic in style. By late 1601, Reni and Albani had moved to Rome to work with the led by Annibale Carracci in fresco decoration of the Farnese Palace. During 1601–1604, his patron was Cardinal Paolo Emilio Sfondrati. By 1604–1605, he received an independent commission for an altarpiece of the Crucifixion of St.
Peter, after a few year sojourn in Bologna, he returned to Rome to become one of the premier painters during the papacy of Paul V. From 1607–1614, he was one of the painters patronized by the Borghese family, Renis frescoed ceiling of the large central hall of garden palace, Casino dellAurora located in the grounds of the Palazzo Pallavicini-Rospigliosi, is considered his masterpiece. The casino was originally a pavilion commissioned by Cardinal Scipione Borghese, the massive fresco is framed in quadri riportati and depicts Apollo in his Chariot preceded by Dawn bringing light to the world. The work is restrained in classicism, copying poses from Roman sarcophagi, there is little concession to perspective, and the vibrantly colored style is antithetical to the tenebrism of Caravaggios followers. 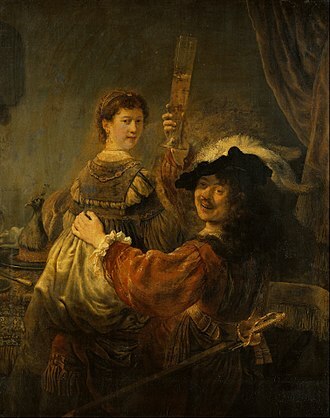 Payments showed that he was paid in 247 scudi and 54 baiocchi upon completion on 24 September 1616, the two families were in rather bad relations, and the reason for such friction was their constant quest for temporal power. 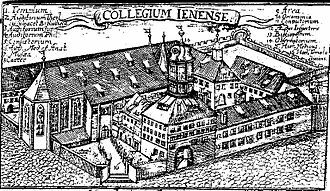 Titus Flavius Clemens, known as Clement of Alexandria to distinguish him from the earlier Clement of Rome, was a Christian theologian who taught at the Catechetical School of Alexandria. A convert to Christianity, he was a man who was familiar with classical Greek philosophy. As his three works demonstrate, Clement was influenced by Hellenistic philosophy to a greater extent than any other Christian thinker of his time, and in particular by Plato. His secret works, which exist only in fragments, suggest that he was familiar with pre-Christian Jewish esotericism and Gnosticism. In one of his works he argued that Greek philosophy had its origin among non-Greeks, among his pupils were Origen and Alexander of Jerusalem. Clement is usually regarded as a Church Father and he is venerated as a saint in Coptic Christianity, Ethiopian Christianity and Anglicanism. He was previously revered in the Roman Catholic Church, but his name was removed from the Roman Martyrology in 1586 by Pope Sixtus V on the advice of Baronius, neither Clements birthdate or birthplace is known with any degree of certainty. It is conjectured that he was born in around 150, according to Epiphanius Scholasticus, he was born in Athens, but there is a tradition of an Alexandrian birth. His parents were pagans, and Clement was a convert to Christianity, in the Protrepticus he displays an extensive knowledge of Greek mythology and mystery religions, which could only have arisen from the practice of his familys religion. Having rejected paganism as a man due to its perceived moral corruption, he travelled in Greece, Asia Minor, Palestine. Clements journeys were primarily a religious undertaking, in around 180, Clement reached Alexandria, where he met Pantaenus, who taught at the Catechetical School of Alexandria. Eusebius suggests that Pantaenus was the head of the school, Clement studied under Pantaenus, and was ordained to the priesthood by Pope Julian before 189. Otherwise, virtually nothing is known of Clements life in Alexandria and he may have been married, a conjecture supported by his writings. During the Severian persecutions of 202–203, Clement left Alexandria, in 211, Alexander of Jerusalem wrote a letter commending him to the Church of Antioch, which may imply that Clement was living in Cappadocia or Jerusalem at that time. Judea or Judæa is the ancient Hebrew and Israelite biblical, the exonymic Roman/English, and the modern-day name of the mountainous southern part of Canaan-Israel. As a consequence of the Bar Kokhba revolt, in 135 CE the region was renamed and merged with Roman Syria to form Syria Palaestina by the victorious Roman Emperor Hadrian, a large part of Judea was included in Jordanian West Bank between 1948 and 1967. 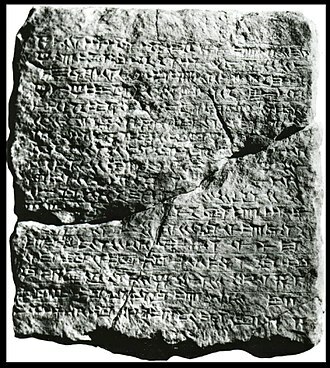 The name Judea is a Greek and Roman adaptation of the name Judah, nimrud Tablet K.3751, dated c.733 BCE, is the earliest known record of the name Judah. Judea was sometimes used as the name for the entire region, in 200 CE Sextus Julius Africanus, cited by Eusebius, described Nazara as a village in Judea. Judea was the used by English-speakers until the Jordanian occupation of the area in 1948. Jordan called the area ad-difa’a al-gharbiya, yehuda is the Hebrew term used for the area in modern Israel since the region was captured and occupied by Israel in 1967. The classical Roman-Jewish historian Josephus wrote, In the limits of Samaria and Judea lies the village Anuath and this is the northern boundary of Judea. The southern parts of Judea, if they be measured lengthways, are bounded by a village adjoining to the confines of Arabia, its breadth is extended from the river Jordan to Joppa. The city Jerusalem is situated in the middle, on which account some have, with sagacity enough. This country begins at Mount Libanus, and the fountains of Jordan, and reaches breadthways to the lake of Tiberias and its inhabitants are a mixture of Jews and Syrians. And thus have I, with all possible brevity, described the country of Judea, Judea is a mountainous region, part of which is considered a desert. It varies greatly in height, rising to an altitude of 1,020 m in the south at Mount Hebron,30 km southwest of Jerusalem, and descending to as much as 400 m below sea level in the east of the region. The climate, moves between Mediterranean in the west and desert climate in the east, with a strip of steppe climate in the middle, major urban areas in the region include Jerusalem, Gush Etzion and Hebron. Geographers divide Judea into several regions, the Hebron hills, the Jerusalem saddle, the Bethel hills and the Judean desert east of Jerusalem, the hills are distinct for their anticline structure. 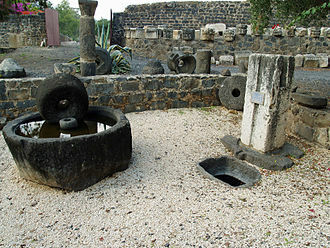 Capernaum was a fishing village established during the time of the Hasmoneans, located on the northern shore of the Sea of Galilee. It had a population of about 1,500, Archaeological excavations have revealed two ancient synagogues built one over the other. A house turned into a church by the Byzantines is said to be the home of Saint Peter, the village was inhabited continuously from the 2nd century BCE to the 11th century CE, when it was abandoned sometime before the Crusader conquest. This includes the re-establishment of the village during the Early Islamic period soon after the 749 earthquake, kfar Nahum, the original name of the small town, means Nahums village in Hebrew, but apparently there is no connection with the prophet named Nahum. In Arabic, it is called Talhum, and it is assumed that this refers to the ruin of Hum. The town is cited in all four gospels where it was reported to have been near the hometown of the apostles Simon Peter, Andrew and John, one Sabbath, Jesus taught in the synagogue in Capernaum and healed a man who was possessed by an unclean spirit. This story is notable for being the one common between the gospels of Mark and Luke, but not contained in the gospel of Matthew. 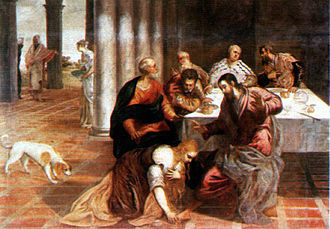 Afterwards, he healed Simon Peters mother-in-law of a fever, according to Luke 7, 1–10 and Matthew 8,5, it is the place where Jesus healed the servant of a Roman centurion who had asked for his help. Capernaum is the location of the healing of the paralytic lowered through the roof to reach Jesus reported in Mark 2, 1–12, and Luke 5, 17–26. In Matthew 9,1 the town is referred to only as his own city, most traditional biblical commentators assume that his own city means Capernaum because of the details which are common to the three synoptic gospels. 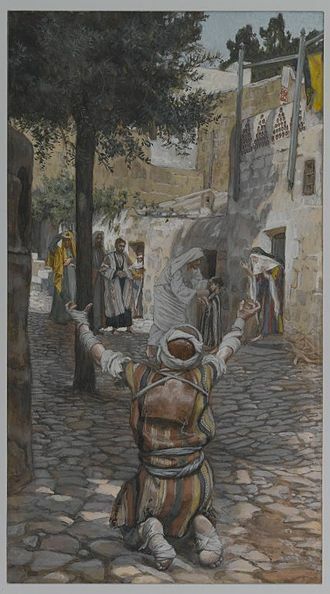 Although the writers of the Jamieson-Fausset-Brown Bible Commentary suggest that alternatively it could refer to Nazareth, according to the Synoptic Gospels, Jesus selected this town as the center of his public ministry in Galilee after he left the small mountainous hamlet of Nazareth. He formally cursed the city, saying you will be thrown down to Hades. because of their lack of faith in him as the Messiah. Archaeological evidence demonstrates that the town was established in the 2nd century BC during the Hasmonean period, the site had no defensive wall and extended along the shore of the nearby lake. The cemetery zone is found 200 meters north of the synagogue and it extended 3 kilometers to Tabgha, an area which appears to have been used for agricultural purposes, judging by the many oil and grain mills which were discovered in the excavation. 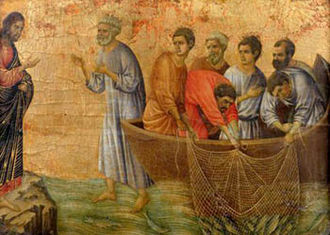 Fishing was a source of income, the remains of another harbor were found to the west of that built by the Franciscans, josephus referred to Capernaum as a fertile spring. He stayed the night there after bruising his wrist in a riding accident, during the first Jewish revolt of 66–70 Capernaum was spared as it didnt have to be occupied by force by the Romans. 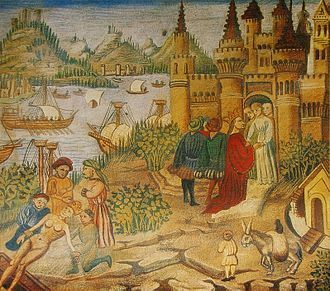 In 1838, American explorer Edward Robinson discovered the ruins of ancient Capernaum, the Franciscans raised a fence to protect the ruins from frequent vandalism, and planted palms and eucalyptus trees brought from Australia to create a small oasis for pilgrims. Hierapolis was an ancient city located on hot springs in classical Phrygia in southwestern Anatolia. Its ruins are adjacent to modern Pamukkale in Turkey and currently comprise an archaeological museum designated as a UNESCO World Heritage Site, the hot springs have been used as a spa since the 2nd century BC, with many patrons retiring or dying there. The large necropolis is filled with sarcophagi, most famously that of Marcus Aurelius Ammianos, the great baths were constructed with huge stone blocks without the use of cement and consisted of various closed or open sections linked together. There are deep niches in the section, including the bath, library. Hierapolis is located in the Büyük Menderes valley adjacent to the modern Turkish cities of Pamukkale and it is located in Turkeys inner Aegean region, which has a temperate climate for most of the year. There are only a few facts known about the origin of the city. No traces of the presence of Hittites or Persians have been found, the Phrygians built a temple, probably in the first half of the 3rd century BC. This temple, originally used by the citizens of the town of Laodicea. Hierapolis was founded as a thermal spa early in the 2nd century BC within the sphere of the Seleucid Empire, Antiochus the Great sent 2,000 Jewish families to Lydia and Phrygia from Babylon and Mesopotamia, joined by more from Judea. The Jewish congregation grew in Hierapolis and has estimated as high as 50,000 in 62 BC. The city was expanded with the booty from the 190 BC Battle of Magnesia where Antiochus the Great was defeated by the Roman ally Eumenes II, following the Treaty of Apamea ending the Syrian War, Eumenes annexed much of Asia Minor, including Hierapolis. Hierapolis became a centre where doctors used the thermal springs as a treatment for their patients. The city began minting coins in the 2nd century BC. These coins give the name Hieropolis and this name eventually changed into Hierapolis, according to the Byzantine geographer Stephanus on account of its large number of temples. In 133 BC, when Attalus III died, he bequeathed his kingdom to Rome, Hierapolis thus became part of the Roman province of Asia. Early Christianity, spread from the Eastern Mediterranean throughout the Roman Empire and beyond, reaching as far east as India. Originally, this progression was closely connected to already established Jewish centers, in the Holy Land, the first followers of Christianity were Jews or biblical proselytes, commonly referred to as Jewish Christians and Godfearers. The Apostolic Sees claim to have founded by one or more of the Apostles of Jesus. 26–36, perhaps following the Great Commission, many of these Early Christians were merchants and others who had practical reasons for traveling to northern Africa, Asia Minor, Arabia and other places. Over 40 such communities were established by the year 100, many in Anatolia, known as Asia Minor and his apostles and early followers, being Jewish or Jewish proselytes, traveled from Galilee to the Jewish Temple in Jerusalem, c. 33, at time the city was under Roman occupation as part of Iudaea province. According to Christian belief, on the day he was resurrected. Jerusalem was the first center of the church, according to the Book of Acts, and according to the Catholic Encyclopedia, the apostles lived and taught there for some time after Pentecost. 130, when all Jews were banished from the city, in about 50, Barnabas and Paul went to Jerusalem to meet with the pillars of the church, James and John. In roughly the time period Rabbinic Judaism made their circumcision requirement of Jewish boys even stricter. When Peter left Jerusalem after Herod Agrippa I tried to kill him, Clement of Alexandria called him Bishop of Jerusalem. 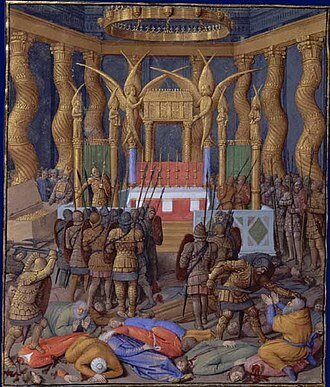 A second-century church historian, wrote that the Sanhedrin martyred him in 62, in 66, the Jews revolted against Rome. Rome besieged Jerusalem for four years, and the city fell in 70, the city was destroyed, including the Temple, and the population was mostly killed or removed. According to a recorded by Eusebius and Epiphanius of Salamis. P. H. R. van Houwelingen, Fleeing forward, The departure of Christians from Jerusalem to Pella, Westminster Theological Journal 65, 181-200. The Cenacle, known as the Upper Room, is a room in Jerusalem traditionally held to be the site of the Last Supper. The word is a derivative of the Latin word cēnō, which means I dine, the Gospel of Mark employs the Ancient Greek, ἀνάγαιον, whereas the Acts of the Apostles uses Ancient Greek, ὑπερῷον, hyperōion, both with the meaning upper room. Jerome used the Latin coenaculum for both Greek words in his Latin Vulgate translation, in Christian tradition, the Upper Room was not only the site of the Last Supper, but the room in which the Holy Spirit alighted upon the eleven apostles after Easter. It is sometimes thought to be the place where the apostles stayed in Jerusalem and, according to the Catholic Encyclopedia, pilgrims to Jerusalem report visiting a structure on Mount Zion commemorating the Last Supper since the fourth century CE. 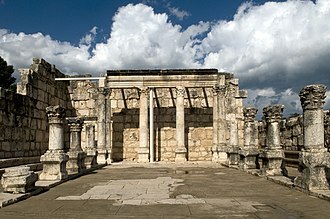 Some scholars would have it that this was the Cenacle, in fact a synagogue from an earlier time, the anonymous pilgrim from Bordeaux, France reported seeing such a synagogue in 333 CE. A Christian synagogue is mentioned in the apocryphal fourth-century Anaphora Pilati, but a Jewish origin for the building has come under serious question for which see below. The building has experienced numerous cycles of destruction and reconstruction, culminating in the Gothic structure which stands today, while the term Cenacle refers only to the Upper Room, the building contains another site of interest. The early history of the Cenacle site is uncertain, scholars have made attempts at establishing a chronology based on archaeological and artistic evidence as well as historical sources. 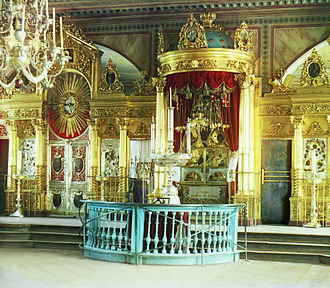 Bargil Pixner, for example, following the survey conducted by Jacob Pinkerfeld in 1948, however, no architectural features associated with early synagogues such as columns, benches, or other accoutrements are present in the lower Tomb chamber. According to Epiphanius, bishop of Salamis writing towards the end of the 4th century, Pixner suggests that the area on Mount Zion was destroyed and that the Cenacle was rebuilt in the first century. The lowest courses of ashlars along the north and south walls are attributed by Pinkerfeld to the late Roman period, Pixner believes rather that they are Herodian-period ashlars, allowing him to date the construction of the building to an earlier period. 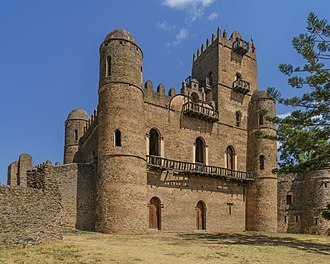 Many scholars, date the walls earliest construction to the Byzantine period, the Roman emperor Theodosius I constructed the five-aisled Hagia Sion basilica likely between 379 and 381 CE. Some have identified this smaller structure as the Cenacle thus demonstrating its independence from, and possible prior existence to, the basilica was damaged by Persian invaders in 614 AD but restored by the patriarch Modestus. In AD1009 the church was destroyed by the Muslim caliph Al-Hakim, shortly afterward it was replaced by the Crusaders with a cathedral named for Saint Mary featuring a central nave and two side aisles. The Cenacle was either repaired or enclosed by the Crusader church, the Crusader cathedral was destroyed soon afterward, in the late 12th or early 13th century, but the Cenacle remained. St Michael Archangel, 1636. The Archangel Michael trampling Satan wears a late-Roman military cloak and cuirass. Held in Santa Maria della Concezione dei Cappuccini, Rome. The Mesha Stele bears the earliest known reference (840 BCE) to the Israelite God Yahweh. The library in 1566, drawn by John Bereblock and given to Queen Elizabeth I as part of a book when she first visited Oxford. Modern scribes with typewriters outside post office, Mandi, Himachal Pradesh, India, 2010. The Church of St Peter near Antakya, Turkey, said to be the spot where Saint Peter first preached the Gospel in Roman Antioch. Remains of the ancient Roman aqueduct in Caesarea Maritima. Schutzengel (English: "Guardian Angel") by Bernhard Plockhorst depicts a guardian angel watching over two children. Irenaus, in Church of St Irenaeus, Lyon. Cambridge University library manuscript 4113 / Papyrus Oxyrhynchus 405. Irenaeus. Ca. 200 AD. 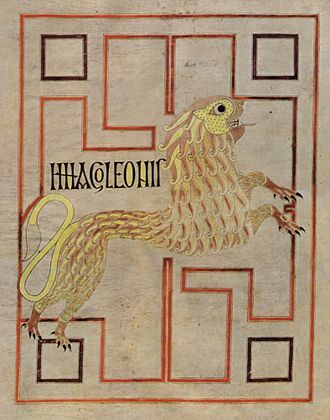 Christ, the Logos incarnate, is the Paedagogus of the work's title. Clement describes the Stromata as a work on various subjects, which spring up in the text like flowers in a meadow.